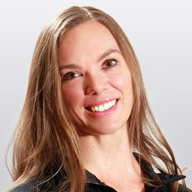 Julie Cordier began teaching the Classical Pilates Method in 2004 and is a Teacher Trainer for Power Pilates. She has continued her studies through The Pilates Center of Boulders Masters Program, The Work with Jay Grimes of Vintage Pilates, and has been studying under and assisting Kathryn Ross-Nash with her Red Thread Program for the last 3 years. Julie has also been teaching the Gyrotonic and Gyrokinesis Methods since 2007 and is a Gyrotonic Master Trainer and is currently studying to become a Gyrokinesis Master Trainer. She has over a 10 years of experience training professionals in both of these movement methods, in addition to her 14 years teaching all levels and abilities of clientele. Julie teaches Internationally and is based out of Cincinnati, OH where she directs and owns BodyMind Balance Pilates and Gyrotonic Studio. Find Julie Hegge Cordier at a studio near you.